If you want a brighter, whiter smile, all you need to do is brush your teeth. With the powerful teeth whitening toothpastes available nowadays, you don’t need to visit a dentist or deal with uncomfortable whitening strips anymore. We have found some of the best toothpastes available to give you the clean feeling you need, with the teeth whitening effects you want. Your teeth can naturally begin to stain over time, especially if you consume stain-causing foods and drinks (like coffee, tea, and wine). Fortunately, whitening toothpastes can whiten and brighten your teeth with every use, so you can feel confident in your smile every time you brush. These toothpastes will remove surface stains, thoroughly clean your teeth, freshen your breath, and leave your teeth whiter in the process. Whitening toothpaste can be used on its own or together with a whitening mouthwash, toothbrush, and/or floss. It is also commonly used after professional dental bleaching treatments to maintain the results. The Mayo Clinic found that whitening toothpastes are generally safe for use twice a day and can take up to six weeks for full effects. However, with some whitening toothpastes, you can begin to see results after the very first use. If you want more than just a white smile, then Colgate Total Whitening Toothpaste is the one for you. It is Amazon’s #1 best seller in toothpastes, and Real Simple and ConsumerSearch also named it the best toothpaste overall. Most importantly, professionals recommend it more often than any other toothpaste. According to the Food and Drug Administration (FDA) and the American Dental Association (ADA), it was the first toothpaste to include triclosan, which is an antibacterial ingredient that can fight gingivitis. The ingredient stays active even after you eat or drink, keeping your teeth clean and fresh until your next brushing. It helps prevent cavities, gingivitis, and plaque, fights tartar, prevents stains, and freshens breath, all while whitening your teeth. It fights germs and prevents bad breath for 12 hours, starts to strengthen enamel after 24 hours, and will help improve gum health and reduce the risk of gum disease within four weeks. While it has powerful whitening ingredients, it shouldn’t burn your mouth or leave your tongue or teeth feeling sensitive. It carries the seal of approval from the ADA and has been certified by independent dental associations in 29 other countries as well. It is recommended for adults and children six years old and over. This affordable Twin Pack offers a great deal because it includes two large 6 oz tubes of toothpaste with “stand-up” flip-top lids. Whitening toothpastes can be abrasive on the teeth, which is what makes Tom's of Maine Antiplaque and Whitening Fluoride-Free Toothpaste so great. It’s perfect if you don’t want fluoride or harmful ingredients in your toothpaste. While it has mild ingredients, nothing about the results are mild. As the only natural brand of toothpaste that’s approved by the ADA, it has no saccharin. Instead, it is sweetened with xylitol, which can help naturally combat harmful bacteria, prevent tooth decay, and clean your teeth. It uses authentic natural ingredients and whitens with naturally sourced silica, which is an ingredient derived from sand. It has no artificial dyes, sweeteners, preservatives, or flavors for you to worry about. The natural, fluoride-free toothpaste uses calcium carbonate as the abrasive, so it isn’t as harsh on your teeth. It is a natural option that will foam up and thoroughly clean your teeth, fight tartar, and freshen breath, while whitening your teeth in the process. The peppermint flavor will also freshen your breath and mouth. It is one of Amazon’s bestsellers, and was also selected as the best teeth whitening toothpaste by TotalBeauty, Men’s Fitness, Real Simple, and ConsumerSearch. This Twin Pack offers a great deal with two 5.5 oz tubes. If you have particularly sensitive teeth, then Sensodyne ProNamel Gentle Whitening Toothpaste, Alpine Breeze, can provide the whitening results you’re looking for without affecting your teeth or mouth. The gentle toothpaste breaks up surface stains while protecting your teeth from sensitivity. If you are commonly bothered by hot, cold, or sugary foods, then this sensitivity relieving toothpaste can help whiten your sensitive teeth. It can prevent cavities, remove stains, harden and strengthen the tooth enamel, and visibly whiten the teeth. It is ideal for people who commonly suffer from canker sores or sensitive teeth and mouths because it contains no sodium laurel sulfates, which can irritate gums and the mouth’s lining. It contains fluoride and potassium nitrate, which is ideal for sensitive mouths. It can also minimize the erosion of tooth enamel, which can lead to further sensitivity. In fact, it is the top dentist recommended brand for protection against acid erosion because it can help re-harden any compromised enamel. It also builds increasing protection against sensitivity to cold, heat, acids, or sweets with continued use. 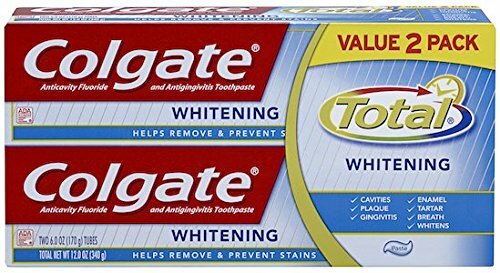 This gentle whitening toothpaste is one of Amazon’s best sellers, a top rated item on Amazon, and was selected as the best whitening toothpaste by Men’s Fitness and ConsumerSearch. It is intended for adults and children age 12 and over. This affordable pack contains three 4 oz tubes of toothpaste with “stand-up” lids. 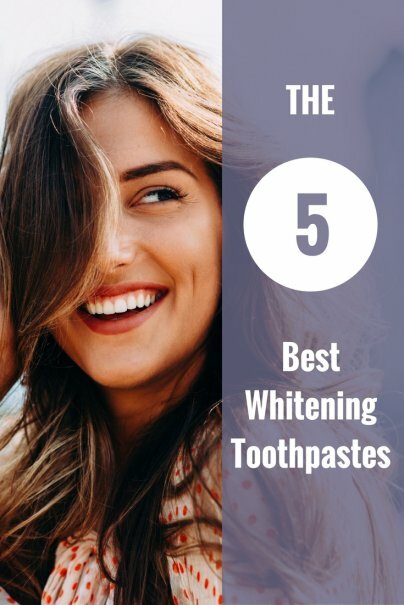 When compared to other whitening toothpastes, the Crest 3D White Glamorous White Teeth Whitening Vibrant Mint Toothpaste is particularly effective at stain removal. It can remove up to 90% of surface stains, fight cavities, and freshen your breath with every use. You can expect to see noticeable results after only one or two uses, and optimal results after only five days. With the exclusive Whitelock technology, future stains will be sealed out. It creates a gentle refreshing foaming action, which can clean hard-to-reach places, prevent cavities, and leave you with visibly cleaner, whiter teeth. The micro-cleansing whiteners polish away surface stains and prevent new stains from forming, even in your teeth’s microfine lines. The fluoride anti-cavity toothpaste is safe on enamel and shouldn’t cause any tooth sensitivity. Crest 3D White Glamorous White Teeth Whitening Vibrant Mint Toothpaste is one of Amazon’s best sellers and is backed by outstanding online reviews and results. In fact, most reviewers and independent review sites agree that this can provide more dramatic results than any other whitening toothpaste. Many people find that they only need to use this toothpaste several times per week for optimal whitening results, but it can also be used on a daily basis. The Crest 3D White Luxe Lustrous Shine Whitening Brilliant Mint Flavor Toothpaste, 4.1 oz is another award-winning choice that will offer similar results, while strengthening and rebuilding weakened enamel. Now Foods Xyliwhite Baking Soda Toothpaste is one of Amazon’s best sellers and is safe enough to be used by adults and children of all ages. The fluoride-free toothpaste gel uses natural vegetarian/vegan ingredients, xylitol, and baking soda to clean and whiten the teeth, so you won’t have to worry about using chemicals to brush. It is non-foaming, but will leave your mouth feeling fresh and clean. It reduces plaque, freshens breath with a fresh mint flavor, and whitens and strengthens the teeth. Xylitol tastes like sugar, but is actually a natural substance derived from fruits and natural sources. It can actually help prevent cavities and gingivitis, instead of harming the teeth the way sugar does. It has well-documented oral health benefits, as evidenced by this pure whitening toothpaste gel. In fact, studies have shown that xylitol and fluoride can be a powerful combination for the teeth and can effectively fight cavities. And those are our recommendations for the best whitening toothpastes. As always, be sure to check Wise Bread's Buying Calendar to learn when and how to buy just about anything!